Yesterday, Hezbollah leader Sayyed Hassan Nasrallah claimed that the Syrian rebels couldn't win against the pro-Assad forces in Syria. "The situation in Syria is getting more complicated (but) anyone who thinks the armed opposition can settle the situation on the ground is very very very mistaken." Today, Syria's Vice President Farouq al-Sharaa claimed that neither the rebels or the government could win. Sharaa said the situation in the country was heading from bad to worse and that a "historic settlement", involving the formation of a national unity government, was needed to end the conflict, al-Akhbar newspaper cited him as saying in its Monday edition. Now even Palestinian refugees are being bombed for taking sides. 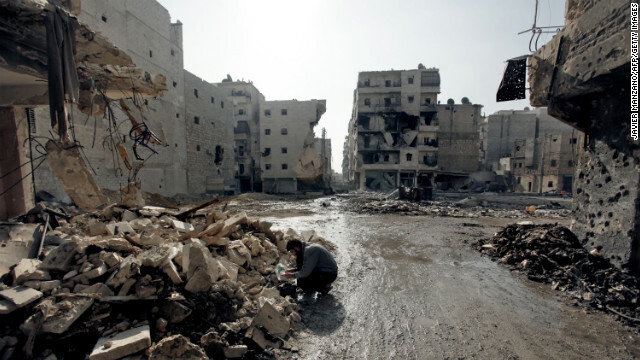 Syria is home to more than 500,000 Palestinian refugees, most living in Yarmouk, and both Assad's government and the mainly Sunni Muslim Syrian rebels have enlisted and also armed Palestinians as the uprising has spread. Heavy fighting broke out 12 days ago between Palestinians loyal to Assad and Syrian rebels, together with a brigade of Palestinian fighters known as Liwaa al Asifah (Storm Brigade). Clashes flared again after the air strike as Palestinians from the pro-Assad Popular Front for the Liberation of Palestine-General Command (PFLP-GC) fought Syrian rebels and other Palestinians, according to the UK-based Syrian Observatory for Human Rights group. The civil war continues, and unsurprisingly, no one can agree on a solution.